Natasa Mavronicola – What Are the Implications of the Brexit Vote for Human Rights? Rachel Davies – Could Germany Offer Young Brits A Life-Vest of EU Citizenship Post-Brexit? Alan Greene – Brexit: The People have spoken…but who asked them in the first place? Máiréad Enright – Travel to England as the Safety Valve on Ireland’s Abortion Regime – Difficulties After Brexit. OLIVER BARTLETT – TV ADVERTISING OF E-CIGARETTES: TO REGULATE OR NOT TO REGULATE? Ipek Akay – The EU-Turkey Deal: Complicating Matters? Derrick Wyatt – What can the UK reform/renegotiation package really hope to achieve? ALAN DASHWOOD – ENDING A BAD MARRIAGE WITH A MESSY DIVORCE – IS THIS THE FUTURE OF THE UK’S RELATIONSHIP WITH THE EUROPEAN UNION? The Rule of Law Conundrum: Bolstering or Eroding the EU? We welcome contributions from academics, practitioners, researchers and advanced students with an interest in a field of EU law. 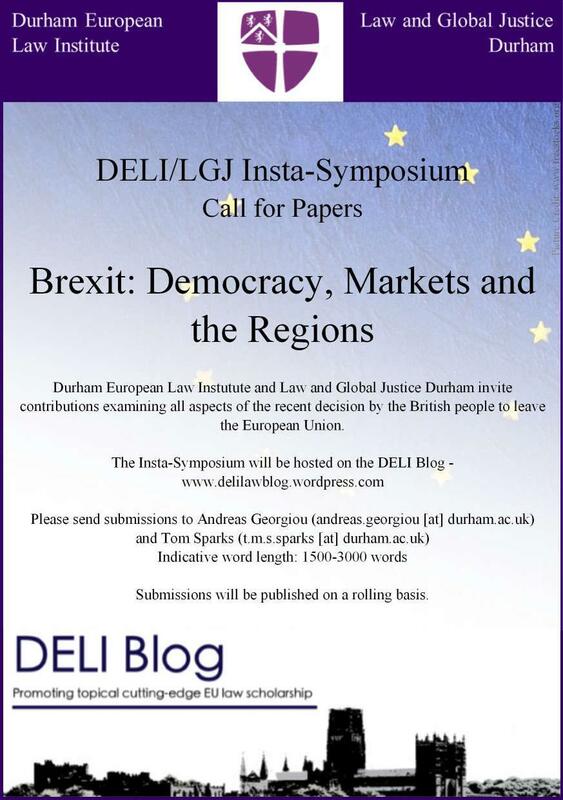 If you would like to contribute to the DELI Blog, please send an e-mail to law.deli[at]durham.ac.uk with the Subject 'DELI Blog post'.